Some people may watch the video below and quickly judge the parents for exploiting their daughter’s talents. Others may be incensed because their child could do comparable work. Still others may be drawn in by the pure innocence of the young girl’s desire to create, experiment, and discover. I, personally, find the video somewhat challenging to watch because I realize that in contrast my creativity has lost much of its child-like wonder. My confession is that I have taken myself too seriously. I have sullied the simplicity of my creative nature with complicated schemes for what I should do with my creation after I have created it. I have weighed my innovation down with convoluted notions and the pressure of public opinion. I have dishonored the purity of the process by focusing my attention and (if I’m completely honest) my a affections on the potential of the end product. I have resigned myself to living within comfortable boundaries, and have limited my vision with regulatory restrictions. I have censored my inquisitive courage, and have instead numbed out to the drone of the familiar. I have busied myself with the dullness of preconceived notions, paying little regard to the awaiting adventure of the unknown. I forget the visceral reactions to awe…and wonder…and delight. In contrast to Aelita Andre, I have become bored, anemic and frail. So whether this video frustrates you (because your child is just as good as she), or whether it infuriates you (because you think her parents opportunistic), or whether you think it brilliant in some aspect or another…may it cause you to take a moment of pause to consider your own creativity…and to hunger for a return to child-like wonderment. 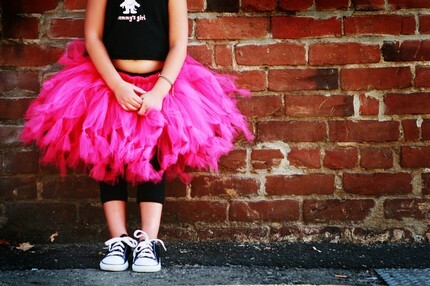 …for some odd reason, I have a sudden urge to paint in a bright pink tutu.